His early work having brought fame both to him and his country, the Kingdom of Italy bought Schiaparelli an 8.6 inch Merz Equatorial Refracting Telescope from famed German optician Georg Merz. In 1874 the telescope was installed on the roof of the Brera Observatory and Schiaparelli used it initially to study double stars. With the opposition of Mars set to happen on September 5, 1877, Schiaparelli turned his sight to the Red Planet. (An “opposition” is an astronomical event that occurs when the Earth is exactly between the Sun and the planet.) It was during this period of observations, beginning on September 12, 1877, that Schiaparelli drew his now famous map of Mars. Here lies, as they say, the rest of the story. In constructing the map, Schiaparelli did not confine himself to pre-existing Martian nomenclature. Camille Flammarion created a map of Mars the year before that incorporating much of the naming conventions employed by Richard Anthony Proctor in his 1867 map of Mars. Schiaparelli chose his own path (the more attentive reader will soon discover the intended pun). To Schiaparelli’s finely trained eye (actually, he was nearsighted, but, as all astronomers know, this doesn’t matter when viewing through a telescope), the “seas” and “continents” of Mars were connected by a series of straight lines that appeared to be natural gullies. So he wrote the Italian word for “gully” on his map. As so began the Martian craze. In many ways, this story represents an excellent prelude to the recent news conference where NASA announced the confirmation of the discovery of seven planets orbiting the star TRAPPIST-1, three of which fall within the so-called “habitable zone” – the range of distance from the host star that astronomers believe is most likely to allow for the creation of life forms. Now, before you get too exciting and start looking for your old Mercury Theatre radio show tapes, let’s get a few things straight. Much like Schiaparelli’s “canals,” we need to be careful we don’t read too much into NASA’s announcement. First, the good news. Our observational techniques have improved tremendously since the time they installed that new Menz telescope atop the Brera Observatory. Many of our best observations, including the one that led to the discovery of the TRAPPIST-1 planets, now occur from space-based platforms. Without the Earth’s atmosphere in the way to muck things up, we can see with an almost unimaginable precision. That being said, astronomers didn’t actually “see” these planets. What they saw were regularly occurring variations in light from this tiny M-class star. From these observations, it doesn’t take much to conclude they’re caused by planets. We can then calculate the size, orbital frequency, and distance from the star for each planet. Similar techniques will allow us to determine that atmospheric make-up of each planet (once the James Webb telescope is launched in 2018). Figuring out what’s in the atmosphere might help us guess whether the planet can support life as we know it. Now for the bad news. Do you know that our own solar system has three planets in the habitable zone? Alas, as near as we can tell, only one of them has advanced life forms (that would be our planet, the Earth, for those still wondering). Venus, in many ways a physical twin of Earth, developed in a way far more hostile to life as we know it. Venus contains no water, has an atmosphere featuring such yummy toxins as carbonyl sulfide, hydrogen sulfide, and sulfur dioxide (with a dash of chlorine thrown in for good measure), and has a surface atmospheric pressure nearly 100 times that of the Earth. Oh, and it’s hot, too. At 864º Fahrenheit, it’s hot enough to melt lead, zinc, and tin, meaning you’re probably not going to get good cell phone service there. Mars, on the other hand, is more temperate. In fact, it can get up to 68º Fahrenheit at noon on the Martian equator. Unfortunately, with only a thin atmosphere, much of that heat dissipates, plunging the night-time equatorial temperatures to 100º below zero (Fahrenheit). The small size of Mars means it doesn’t have much of an atmosphere. It’s surface atmospheric pressure is more than 100 times less than that of Earth. In addition, unlike our Nitrogen-Oxygen air, the Martian air is nearly all carbon dioxide (a key fact Al Gore overlooks when he talks about global warming). Still, with traces of water, we continue to have hope we’ll discover some form of elementary life on Mars. Not little green men, but maybe something simple like bacteria, fungi, and other types of microbial life. 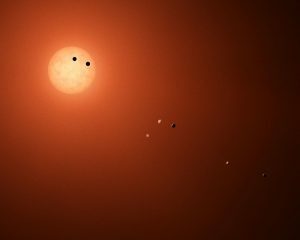 Likewise for the TRAPPIST-1 planets, just because a planet is in the habitable zone doesn’t mean it has life. The news gets worse. Remember how I referred to TRAPPIST-1 as an “M-class star.” This is different from the “M-class planets” you heard about on Star Trek (those were Earth-like planets). Well, M-class stars are small low temperature red dwarfs. Located in the constellation Aquarius, TRAPPIST-1 is about a tenth of the size of the Sun and only half as hot. That means the habitable zone is a lot closer, meaning the relevant planets are exposed to more intense forms of radiation. Making matters worse, dwarf stars in particular are known for their violent and frequent flares early in their evolution. These flares can strip a planet of its atmosphere, leaving it nothing more than a barren rock. Mind you, TRAPPIST-1 appears to be beyond this phase of its life and the planets appear to have migrated to their current orbits from outer orbits, so they may have escaped this deluge. There may be another problem. First, the planets are close together. All orbit their star roughly within the same distance Mercury is from our Sun. This may produce a phenomenon known as “tidal locking,” meaning the same side of the planet always faces the star. It’s hard to produce sustainable life if one side of the planet it very hot and the other side is very cool. Imagine the velocity of the winds between these two temperature zones. Finally, TRAPPIST-1 is only (and at least) 500 million years old. This might not be long enough for life to brew in these planetary cauldrons. Geological evidence on Earth suggests it took at least a billion years for the most rudimentary evidence of life to appear. The dinosaurs didn’t come about until 4.3 billion years. Lastly, it took us the entire age of the solar system – 4.5 billion years, to develop the technology to discover the planets of TRAPPIST-1. Like I said, don’t get too excited about TRAPPIST-1 providing conclusive evidence that we are not alone.